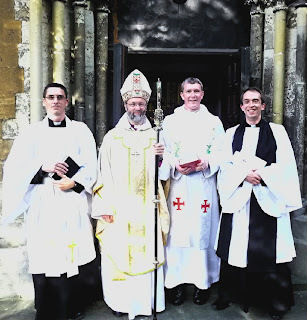 Bishop Alan’s Blog: Why ordination? Why today? Your task is to keep telling the basic story, representing the presence of the Spirit, insisting on the priority of God, speaking the biblical words of command and promise and invitation. "With these vows of ordination we are lashing you fast to the mast of word and sacrament so that you will be unable to respond to the siren voices"
Even if they're part of a discernment process by the whole church resulting in new insights of where the Holy Spirit might be leading us? Even if the priests themselves feel strongly guided by God? Must they stay as they are, promise not to grow and change? Thanks for this post. Where does the Eugene Peterson quotation come from? Thank you, Alan - that's a wonderful quote from one of my favourite authors. That is gorgeous. What is the citation for the Peterson? Thanks to all for comments and kind words. The quotations were from his book "Working the Angles — The shape of pastoral integrity" (Eerdmans, 1987) pp 1-2, and 24-5. I didn't read Peterson as wanting to say nothing should change full stop, or that all voices were siren voices; just that, within the classical story to which he was alluding, the Church needed people to focus on word and sacrament as a first priority; partly perhaps to help us all discern which voices were siren voices by providing a reference point. Was it Peterson's quote you picked up in Gerrards Cross? The pastor’s responsibility is to keep the community attentive to God." Peterson's book 'Under the Unpredictable Plant' is one of the best ever books about pastoral ministry - based on the story of Jonah, of all things! A close runner up is his 'Five Smooth Stones for Pastoral Ministry', based on the 'writings'. I picked up the second quote in gerrards Cross, having come across the book years ago as a manual for Spiritual direction then been surprised to see it, I think, at Willow Creek a few years later. Behind all these quotes, however, lies a response to Martin Thornton, whose writings intrduced me to much I have valued thirty years ago. Christian Proficiency is one of those books I've read a few times but would like to read again, and his sermon "The Rock and the River" started the train of thought that saved me from spending the rest of my life locked into futile Conservative/Liberal sumo wrestling between tradition and innovation. Thanks for this great quote. 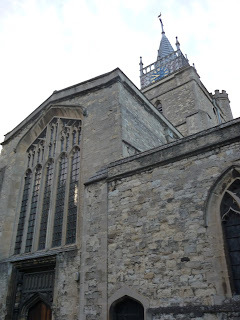 I have been asked to preach next month at an Institution of a dear friend and will be able to use some of it then. "The Rock and the River" started the train of thought that saved me from spending the rest of my life locked into futile Conservative/Liberal sumo wrestling between tradition and innovation." Sounds like that has to go on my book wishlist. I'm glad I misunderstood you! This is a joyful post, which gives me great food for thought and hope for the future. Testing a vocation is difficult, and sometimes I think that I should give up, but inspiration and affirmation comes from different directions. Here is inspiration for me - as well as an excellent guide for a possible future way. but, as I once attended an Ash Wednesday service to find the reading read spoke of not having any outward signs for our piety, did not Jesus tell us not to swear oaths but that we should allow our 'yes' to be just that, along with our 'no'? Is the cause of a denomination to persevere in that denomination's idea of The Way or to attempt to bring Jesus' teaching back to the world? Good stuff from Eugene H. Peterson (and Martin Thornton) -- all except that sentence. I disagree with the "one". The "one" applies to bishops, not priests or pastors, though, of course, bishops are also ordained. A given congregation can (and i would say should) have several priests and pastors (not necessarily the same people -- pastors need not necessarily be priests). Thanks to all for latest comments and thoughts. I lovd the image of the parrot on the shoulder from Guildford. UKV/FTTFTB, All best on the vocations journey wherever it leads. Steve, I'm not right sure what particular denomination Eugene H.Peterson belongs to, but it may well not be formally episcopally ordered; in which case I supose ordination does roughly correspond to the kind of "Presbyter bshops" Lightfoot detected in the early Church. What I find helful in his analysis is his insistence that the pastor is onenof the ordinary sinners, albeit one with particuylar responsibilities. I have spent many hours with people who were all agreed that the one-man-band model of ministry was not a good thing, but getting rid of it and the assumptions on which it was based seemed remarkably difficult. Juan Carlos Ortiz, a Pentecostal from Argentina, compared it to a football match -- 22000 people who desperately need exercise watching 22 who desperately need rest. When I look back to that original Supper I do not see priest and people but thirteen members of what we would now call the laity breaking bread together. Somewhere between then and now we have lost that sense of equitable celebration. I'm afraid clericalism has a lot to do with this. Now that the Christendom icecap is melting might there be an opportunity to think the unthinkable.